Your son must be very excited RE! 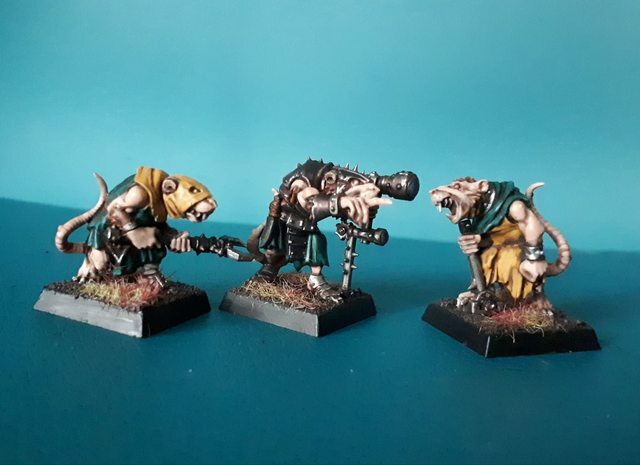 I'm trying to make the Skaven a bit more flashy but Clan Eshin doesn't really do flashy. I think the bright yellow lamp helps a bit but perhaps I'll try out the red eyes. Red eyes are definitely helping on my Trolls. I'm kind of wishing I'd gone for brighter metal and reds on the gobbos but it is counter-intuitive. 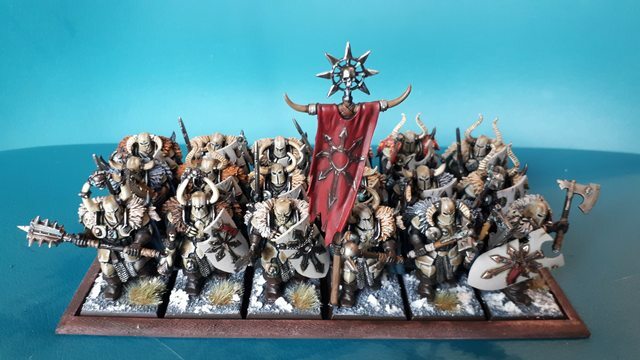 Finishing the last 7 Chaos Warriors as well! Productive while I can! Moving on the the Gutter Runners now, and the Warplighting Cannon. Hope to see them in battle at some point. The armor is really nice looking, but that double handed mace is astounding! Where'd you get it? The top is from the Chaos Knights kit, it took some effort to position the hands to make it look like it does - glad to see it paid off! First it has to get across the table to our sneaky elves Rod! True. The default sneaky elven approach to these kinds of units is "make it go somewhere else until you can gang up on it". Here's the WLC done, time for the crew. Love it, the parts are really well defined. Yeah, looking good. Spikey, menacing and completely wacky. Just the way it's supposed to be. And the painting itself is clean and tide and the details really pop out. Slowly starting to come together. They're already looking good. 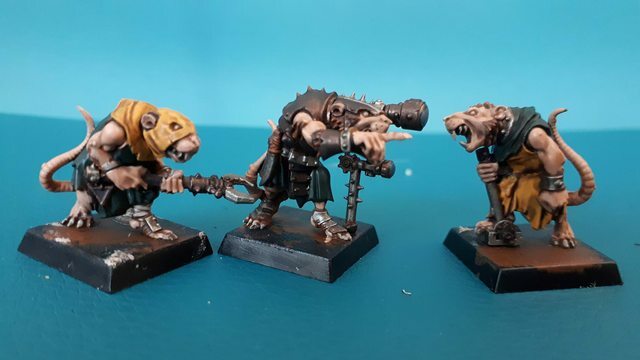 I agree, love that mustardy yellow on Skaven. Also, I'm playing a game tomorrow! Its 2400p against Vampire Counts and I'll be taking Chaos to welcome them. I remember buying that issue in Dublin! Your son follows Man Utd RE? Looks meaty. Key is killing enough stuff to avoid unwanted Ld tests I think. 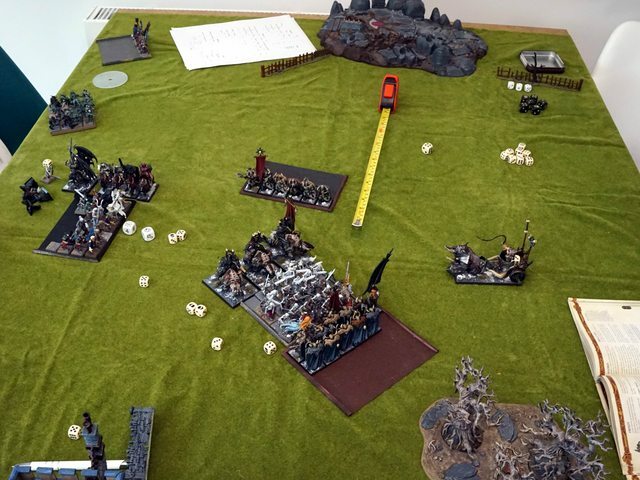 The Dogs of War sure got whooped by Beastmen that time! Both forces put most of their strength in the northern flanks - who would prevail? Blender called for here surely? Slightly worrying that the Chaos army doesn't look horribly outnumbered. The Undead general was just a Master Necromancer. I got Spirit Leech, Doom&Darkness, Soulblight and Caress of Laniph. The VC got most of the Lore of Vampires, to be honest. I move up the field, with the right flank advancing the farthest, screened by some Marauder Horsemen. I successfully snipe the Wight BSB with Spirit Leech but the Hellcannon misses. Dire Wolves charge my southern Marauders and run them down. Hexwraiths move through one of the Chaos Warrior units, slaying 5. 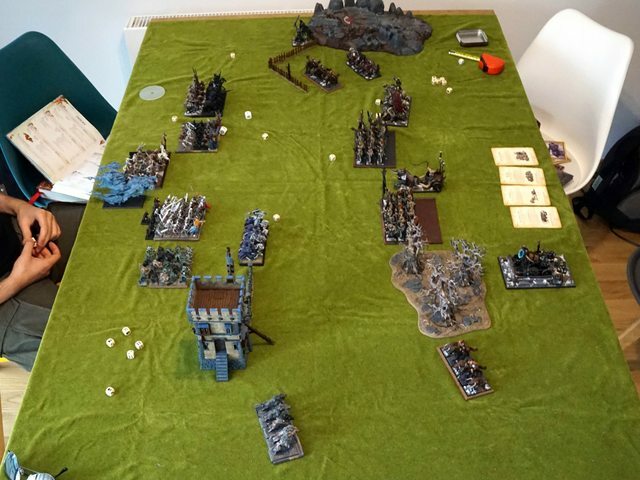 The magic phase is eventful as the Master Necromancer casts Curse of Years on my other Warriors only to Cascade himself into oblivion (the Mortis Engine allowed me to chose one of two miscast results rolled - such a double-edged sword!). 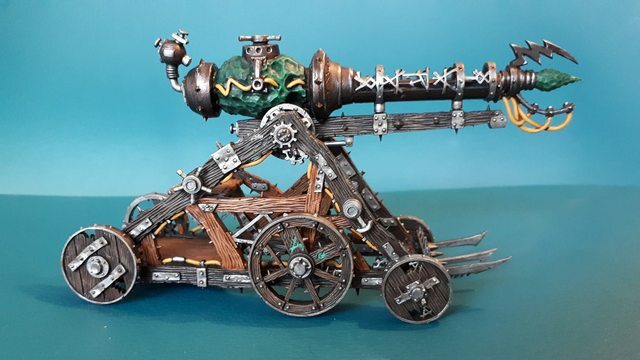 The crumble took several undead warriors, but crucially the reason behind all this - the Mortis Engine! 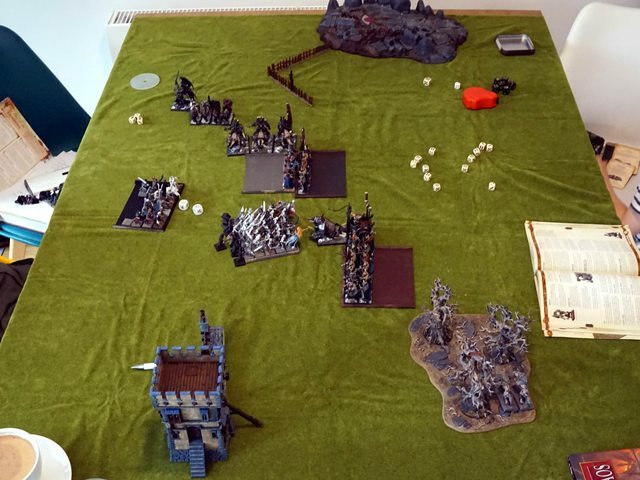 Eager to take advantage of my opponents bad luck I threw my Daemon Prince against his Black Knights and the Hellcannon against his Hexwraiths (he did not expect it to be able to charge at all, let alone have magical attacks...). The rest of the army moved up. I dispelled the Curse of Years in my magic phase (though it did somehow kill 6 of my guys the previous round). 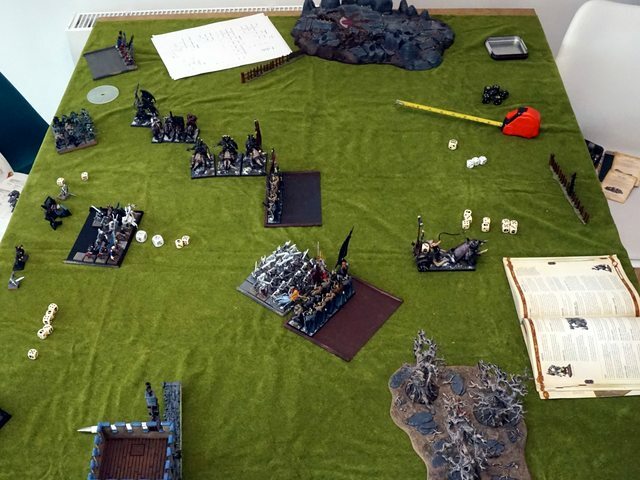 The Daemon Prince killed 2 knights and took a wound, while the Hexwraiths were wiped out. 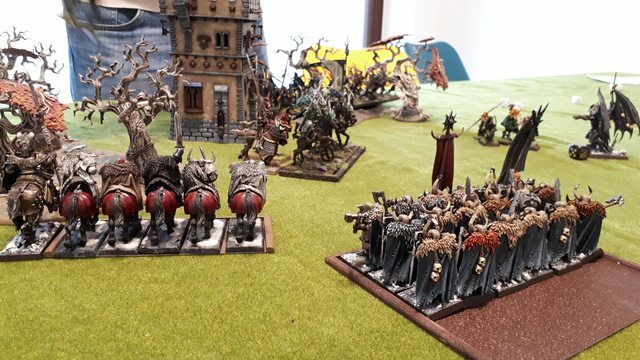 My discouraged friend decided to counter attack and so the Grave Guards hit the Marauders (and then the Warriors with Great Weapons), while the Ghouls went for my BSB and his retinue. The magic phase was quite spectacular (mostly due to my poor dispels) and Hellish Vigour and Vanhels were both cast (one as a big bubble). This helped his fights but he achieved no major breakthroughs. 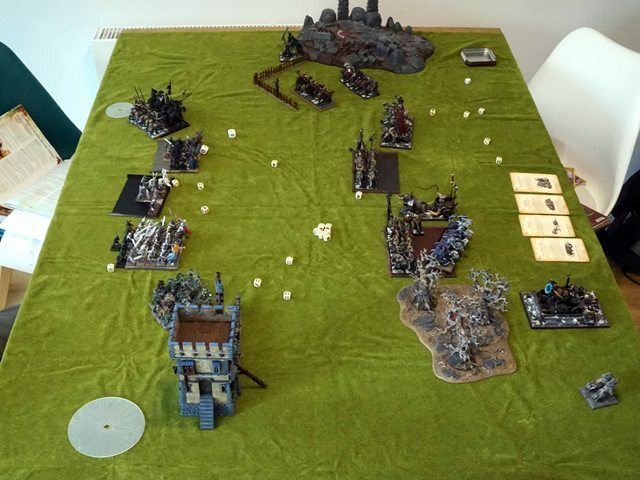 Chaos Knights join the Daemon Prince and wipe out the Black Knights. The Crushers charge the flank of the Grave Guards, who get beaten badly despite their buffs, but hold on by a thread. 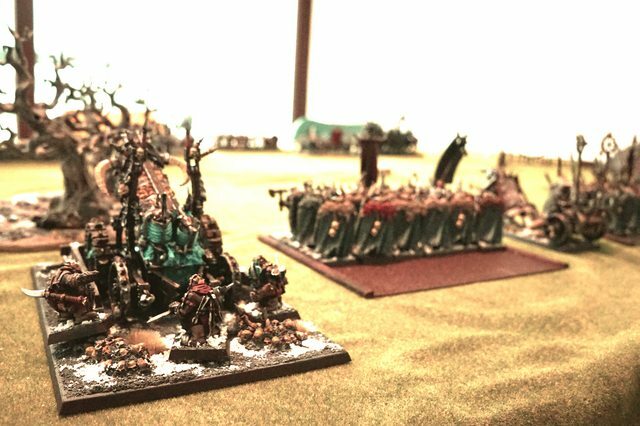 The Gorebeast Chariot crashes into the side of the Ghouls and they all crumble. Skeletons charge the Gorebeast Chariot, break it and overrun into the Warriors. Daemon Prince and Knights into the Zombies guarding the rear. Crushers into the back of the Skeletons. "I outnumber you one to two." Seriously, he needed more killing power. 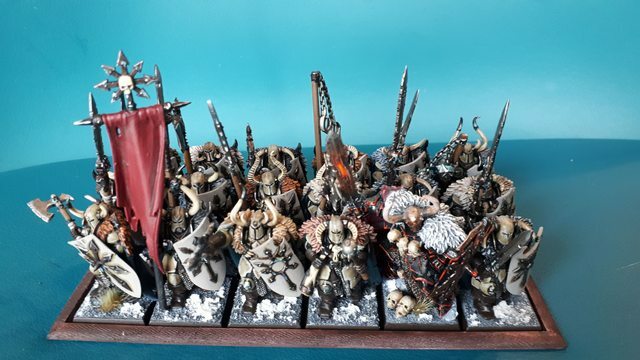 Would have been quite funny to see these charge the Hellcannon. Mortis Engine allowed me to chose one of two miscast results rolled - such a double-edged sword! Yeah, I'd think twice before taking that Blasphemous Tome upgrade. Who were henceforth as good as dead. It all went so horribly wrong for your opponent RE. Beaten by such a young player (the photos reveal) too! Beaten by such a young player (the photos reveal) too! Fun battle to get back into it all I think. I'm not even sure the VC player could have done a lot there, to be honest. It read like a slow crumble towards an almost inevitable massacre. Each turn some crucial bit of the army disappeared. 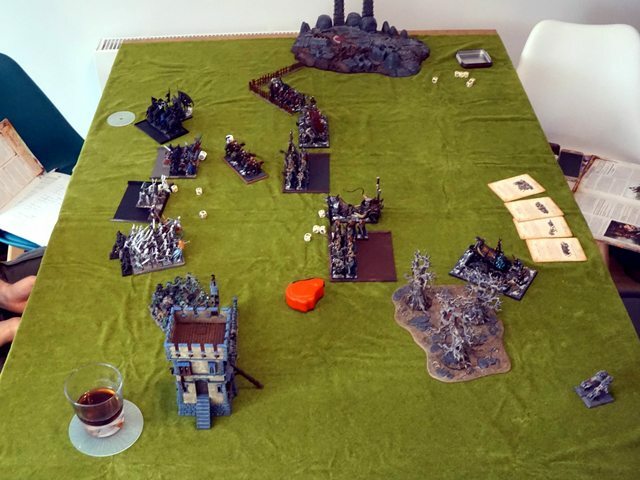 It feels like the battle was pretty much over after turn 2 (unless you'd have run into some pretty bad dice, which is always an option of course). The Mortis engine taking a tour of the warp was unlucky of course. But I'm not sure it would have made a big enough impact here. The list lacked either fighting power or enough stamina to grind everything down while being backed up by magic. Perhaps a more defensive approach could have worked for the player. Turtle up on one flank, spam some magic, and make a much slower, more coordinated push. Though, with the hell canon and spirit leech on the table, that could also have been painful. Even more so with the mortis engine (and thus a lot of magic) disappearing T1. I think some Crypt Horrors to anchor the list would make a lot of sense - 3+ Regeneration backed with consistent Nehek is something I'd struggle against. He could then use either unit of wights to swing in for the kill. My army worked pretty much as planned - I'm always surprised at how just a rank or two of Warriors get the job done. 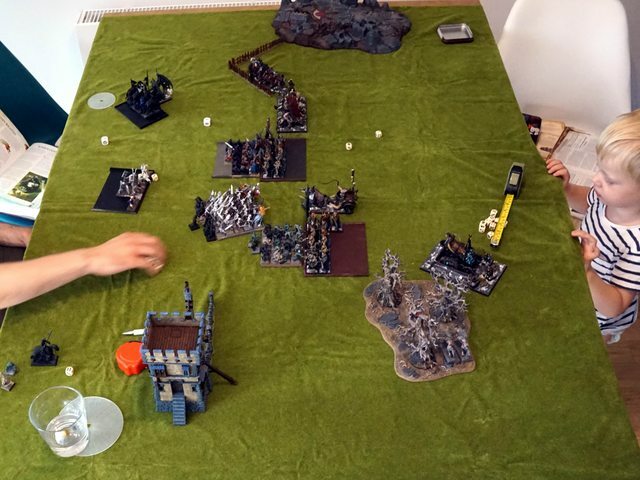 I was a step away from running a couple of time though - relatively low Ld (the general being far away), -1Ld from Aura of Dark Majesty on the Vampire and Terror checks from the Banshee made me nervous. 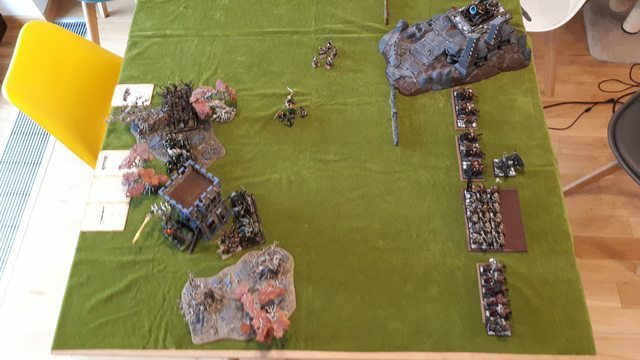 The right flank was a joy - Marauders shielding, Knights providing something of an anvil, Crusher waiting to counter-charge and the Daemon Prince looming on the extreme flank. Lovely! It read like a slow crumble towards an almost inevitable massacre. Losing the Lord early really hurt. There must be other ways to boost the magic phase. Mortis Engine is a good punt without the miscast-risking upgrade. Though how that might work with Earthing Rod is interesting. Exactly, they really complement the Engine and are decent anyway. Still waiting for a rematch. Took me a while to work out what the thing on the left was (rear view). 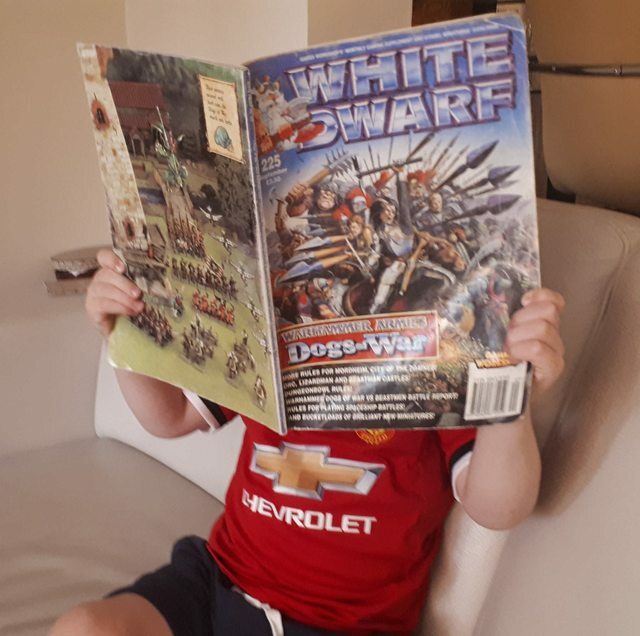 "Ah, those are Chaos Warriors, so that must be a..."
You too RE, good to hear from you! Good luck on the exam next week! Ok. Got an A on the first part of the exam, so things should be ok. Managed to play a game, too! 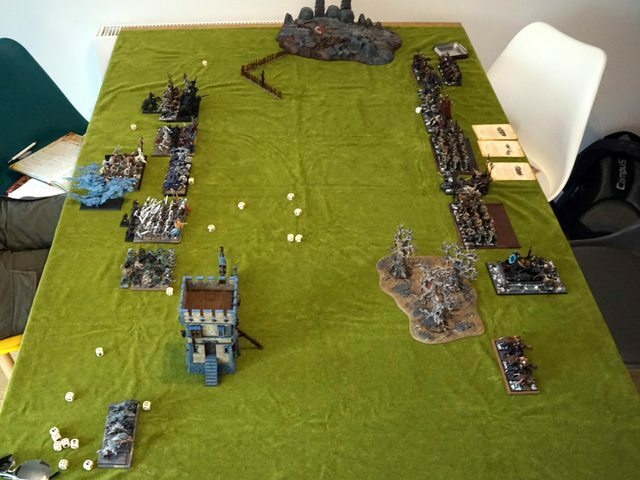 Warriors of Chaos vs Wood Elves at just 1,6k points. Might favour those pesky elves RE? I did forget how good their anti-armour is! My DP got the Bolt of Change (I didn't get to cast it). New Wood Elves go through armour like butter. I believe these count as Magic Weapons so negate the Banner but I’m not certain. Yeah, I don’t like the paucity of magic.